If the attackers obtain sensitive information data like social security number, personal name, phone number, and email address, they will likely start phishing victims. The person will receive personalized emails with malicious codes or links to resources infected with a virus. These emails will look as if they were sent by a friend or a company the targeted victim is a client of. Studies show that users are inattentive to such mailings — 40% of the participants in an experiment opened these emails and followed unreliable links. These data are also very popular among spammers and advertising agencies. Unlike questionnaires, where customers often enter distorted or fictional contact information, users often provide reliable information in personal e-services boards. Contact information can also be used to collect information about people, including passwords for their accounts on different services. What does the identity-theft protection service do? This is one of the best services, providing a great set of features for an attractive and affordable price. Pricing: from $12.95/mo, personal and business plans. The service is one of the best and offers high-level protection at an attractive price, providing a huge set of features without you having to pay too much. 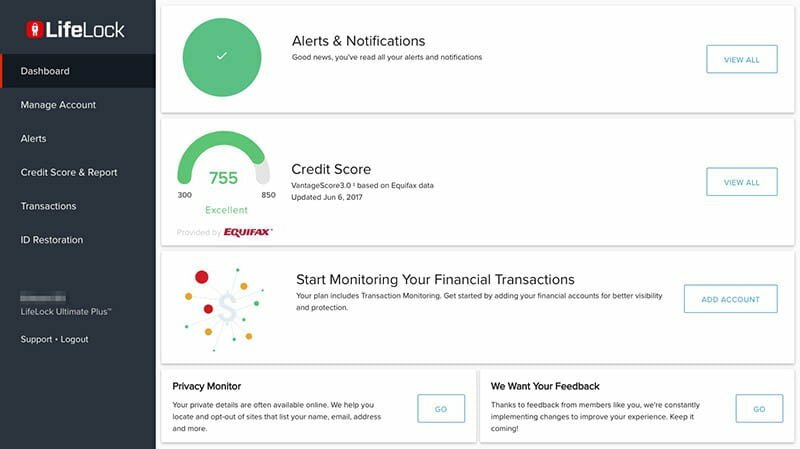 The company provides credit monitoring and attorneys to control your credit history using the databases of all three major credit bureaus. If something wrong happens, you will be immediately notified via email and the mobile app. You will know all the details about your personal accounts and financial credentials. In addition, you have an option of insurance and restore. The convenient dashboard offers access to all the features in one place. 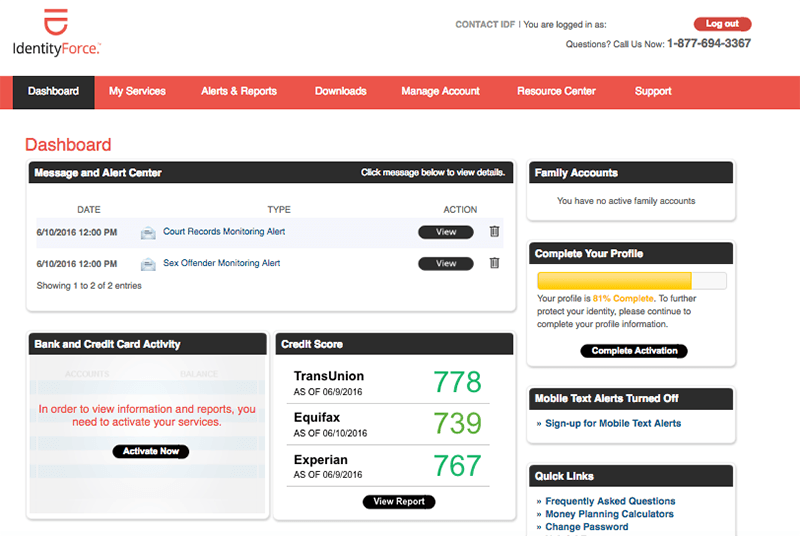 You are able to control all your personal information such as credit score, recent alerts, and notifications, or links to other family members. The interface is very intuitive and easy to use. You will not need to make my efforts to access the necessary information. This service offers attractive family features. If you plan to share the service with the whole family, there are a number of options, including child protection and many others. The company also offers discounts for several family members. You will be able to save up to 50% when getting the annual subscription. The mobile app is very limited, it is not rich in features, and does not provide the full functionality of the service. In fact, its main task is to notify when you require to contact the identity theft protection provider. You will not even be able to see the alert, having to use the web version of the service for that. However, even the website will not help to solve any issues. The only way to solve them is to call the phone support. No options for pre-existing theft. This service is really great if something happens after you already are a subscriber. However, if anything happened before that, they will not help you at all, even if the paperwork is the part of discovering the problem. 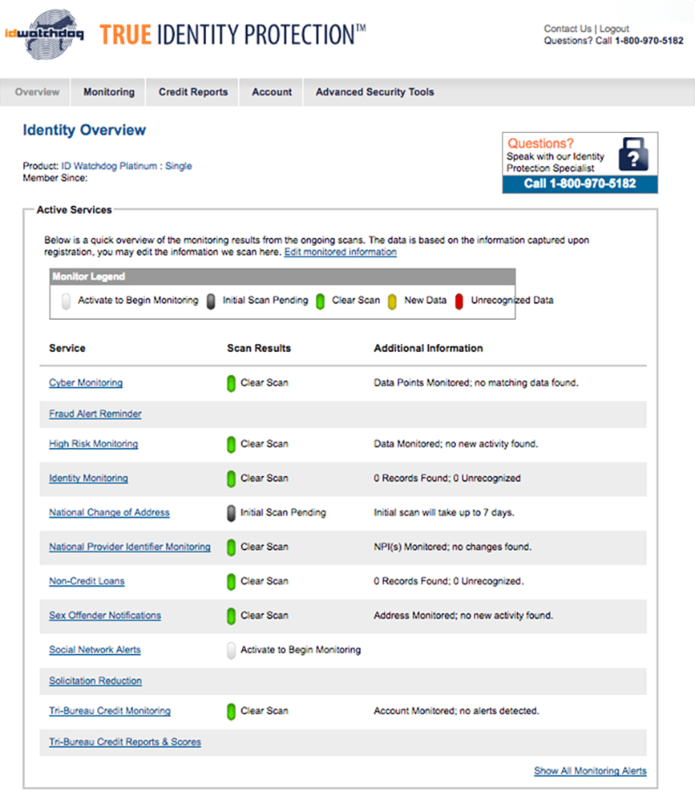 So, if you have to solve a pre-existing identity theft issue, IdentityForce is not the best solution. This is an advanced theft protection service with an extremely feature-rich app and detailed notifications. Pricing: from $9.99 per month. Fantastic feature-rich The mobile application is really the best among the competitors. If you usually solve your problems by using your mobile device, this service is the best solution for your needs. In fact, you can do everything without a computer and without the need to call the phone support team. It really is a great option and allows you to save a lot of time and effort. Detailed notifications. The company offers notifications for a huge number of scenarios that are not supported and monitored by other companies. They include third-party data breaches and all the words about the crimes committed using your stolen data. Of course, these features are not vital but they are a great extra level of protection and assurance. The company also offers an option to get the notifications on the phone. In that case, you will immediately receive the explanation about what the information means. Extra payment to resolve any pre-existing theft. The cheapest plan offers a solution only after you signed up. If anything happened before you subscribed, they will not be able to help. However, if you subscribe to a more expensive plan, the will solve any issues. For some this may not be the best option but, in general, you know what you pay for. This is the best service to solve already existing issues. Choose them if you already know something is wrong: the company is ready to help you. Rehabilitation for pre-existing theft. In their basic tariff plan, they do not provide anything extraordinary, just a set of features and notifications including financial, credit score, and bank account monitoring. At the same time, they have the biggest advantage over the competitors: retroactive protection services. This company is the only one that offers the option to solve issues that happened before you became their subscriber. So, choose this service if you are already a victim. However, you must be ready to pay some extra money for assistance. Unlike their competitors, this is a one-time payment and no membership is not required. They have an extremely outdated and ugly website which is not entirely logical. It is difficult to understand how to use it, has an outdated layout and font, and very limited features. As a result, you will have to call the phone support to solve any issue. 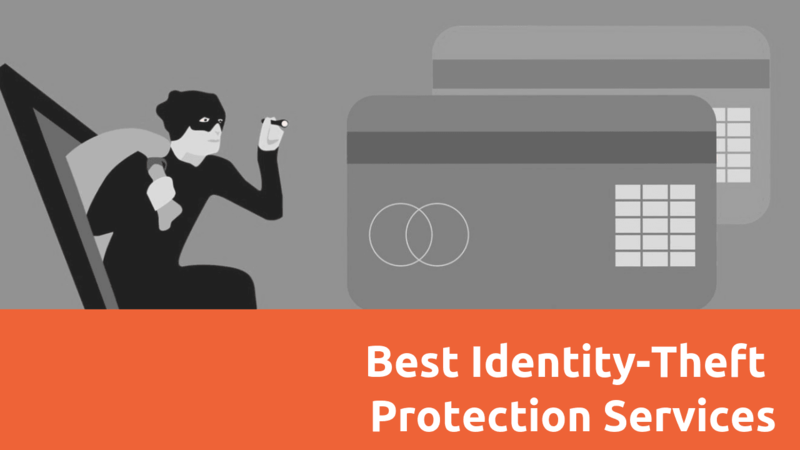 In a few words, identity theft protection services protect your personal data, similar to an antivirus. For this type of protection, you have to pay an annual or monthly fee. In most cases, they monitor your credit reliability and provide some additional services. For example, they can notify you about any potential issues or help avoid higher risks. At the same time, they cannot predict all the illegal activities. They once notify you after the theft has taken place. So, the biggest advantage of these services is that you can avoid having to deal with larger-scale consequences. For example, if someone stole and misused your financial data, the earlier you find out about that, the less dangerous the consequences will be. Most companies on the market provide three main services: monitoring, alerts, and recovery. The set of services depends on the package you choose. The higher the protection you require, the more expensive the cost will be. Let’s take a closer look at these solutions. The identity-theft protection company monitors the Internet looking for your personal data, how it is used by different organizations and whether it was used illegally. So, if someone stole your identity and takes credit or makes any illegal activity, the company must detect it and notify you. The identity theft protection company must immediately notify you when someone used your sensitive data illegally or without your permission. It is a very important feature because almost no one knows about being scammed until they get notified about a huge debt, the bank account is depleted, or their credit is wrecked. If you found out too late about this happening, you can suffer a lot because of it. This is some sort of insurance against illegal activity taking place using your identity. You have the chance to recover lost money, damaged credit, broken reputation and get monetary compensation. Most market participants offer insurance of up to $1 million. You have already become the victim of identity theft or there is a huge risk of it. For example, you lost your Social Security information or some of your information has been disclosed. When this happens, criminals can easily access your personal data and use it in their own interest. You are not ready to freeze your credit reports. You are not very experienced or do not have enough time to constantly monitor your sensitive data available online. In this case, trusting it to a third-party service is a great solution. You probably heard this many times: set strong passwords for important accounts! But it is really very important. Attackers can gain more power over you if they access, for example, your personal social networks accounts. They will not only have access to all your messages and personal data but they will also be able to communicate with your friends on your behalf. Many of us received requests to borrow money from our friends only to turn out that our friends knew nothing about that. It is not enough to come up with a strong password. You must use a unique password that will not be possible to be hacked for each service and for each of your account. It is recommended to use a password manager to store your passwords safely. When you use your accounts from different computers, especially when it comes to computers in public places, you are especially vulnerable to hackers. Many services support the two-factor authentication, with Google being one example. This protection means that it is not enough for you to know the password in order to log in. You will need to pass another check: enter a code received by SMS, confirm your identity in the application on your phone, etc. This greatly increases your online security. Try to share your personal information less. Do not spread much the information about yourself, such as your date of birth, graduation year, maiden name, pet nicknames, etc. This does not mean that you need to completely hide your online presence, but be careful when you share with some people some details of your life. We have been using the Internet for quite a long time to accumulate a lot of accounts on various sites. How often did you enter information about yourself? Date of birth, wedding date, etc. Try to remember the personal details you shared online. Where did you register? What services do you no longer use? Delete accounts that you no longer need. The careless attitude regarding personal data is one of the biggest problems in today’s world. Often, people recklessly provide their phone number or email address in order to participate in various marketing research or to receive bonus cards and it’s hard to guess how much data these resources store. Do not add in such questionnaires the email address you use for important tasks and do not use a personal email for working correspondence. To protect yourself from illegal actions, it makes sense to create a separate e-mail for such services. It is recommended but not necessary that you use a secure email provider for this. Avoid visiting dubious links even if they are sent by friends and installing applications from untrusted sources. When installing and using applications, check what rights and information they request. In the case of any suspicious request, carefully check the email address of the person who wrote the message to make sure that they really are who they claim to be, do not follow the links and do not open attachments if you are not sure that they are addressed to you. It is also worth using licensed programs and regularly updating them. Installing additional information protection tools will help you not only create a barrier for fraudsters, but also build an evidence base.